New rules for Accessing / Hacking into a Computer Network System. Nearly a dozen all-new Computer Terminals and systems including Series P6 Terminal and Virtual Reality Suit. 7 All-new Operating Systems including an Advanced Artificial Intelligence Operating System. Nearly 20 Computer Terminals Modifications including Fiber Optic Circuitry, Laser Modem and Removable Hard Drive. Over 50 All-new computer programs including Attack v1.0, Force Crash, Pig v2.0 and Skeleton Key. 8 All new Feats including Co-Op Hack and Improved Firewall. 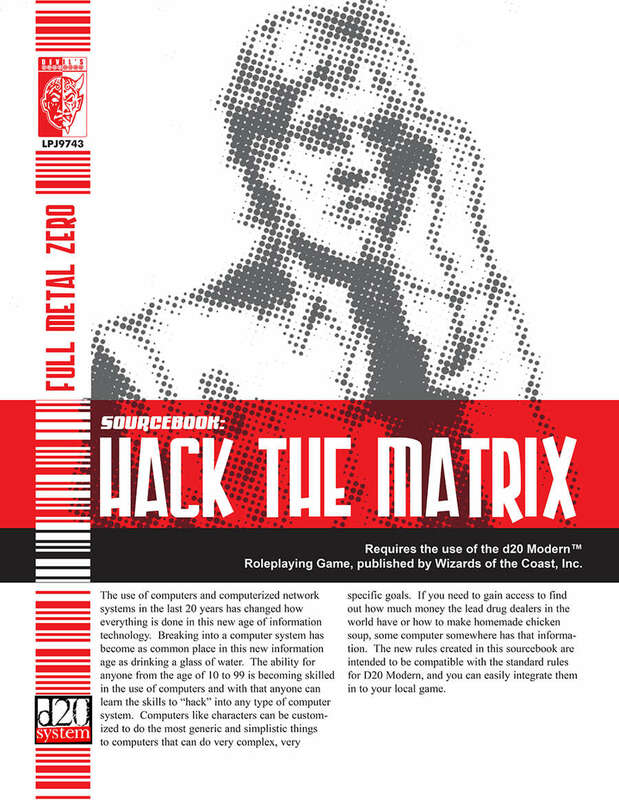 This 18 page PDF is just the sort of thing needed for GMs to add depth to any great d20 Modern campaign world, including Haven: City of Violence and Haven: Full Metal Zero.